In my previous post about NFC Contactless Cards, we had a brief introduction mentioning NFC payment methods, and how to implement APDUs commands to generate a connection to obtain basic information. In this post, I will explain one of the most important attacks against NFC and contactless cards that many malicious attackers implement to obtain critical information. The techniques that I will write about are not limited and could be modified to work against different platforms or brands. We have two nested loops: 1..31 and inside 1..256. This means that the card could have 31 SFIs and 256 records inside each SFI. We are talking about 7650 possible combinations! The read_record function creates a combined APDU command with the data of the two cycles to request data from the card. With this APDU command, we are ready to request a record. This attack with all different combinations could be effective when we do not have any previous information about the card, but in this case, we do. We know that it is a VISA Debit/Credit, and its AID is A0000000031010. So we can narrow our brute force range to do it in seconds. We know that the card is using the Visa payWave technology for contactless cards; as result, we can reduce dramatically our attack. Peter reduced drastically the search spectrum splitting the code in different files depending on the contactless technology. 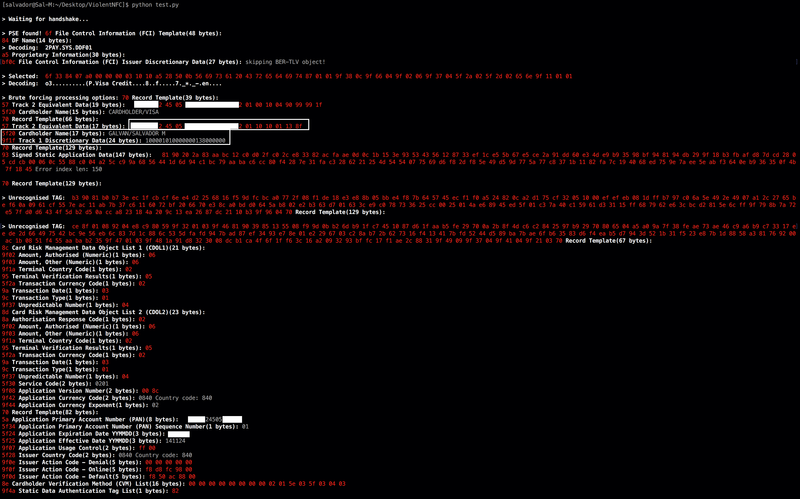 However, I implemented a different approach: just one file to attack all the “logic” SFIs positions. So let’s grab some information, running a brute forcing attack against processing options in Samsung Pay NFC. With the new Cardholder/discretionary data, we are just 3 digits away from the original track 1! So how we can get the original 3 digits? How the cryptogram plays its role? We should discuss these questions in a future post. On the question regarding the track data, there is basically no way you can derive the CVC1 value from the magnetic stripe track 2, by just reading the EMV data (without having the key used to derive both values to begin with). In terms of the role played by the cryptogram, you can’t derive a valid value by just reading the card data. You would need the key, which you can’t get.